Will Technology Replace Administrative Assistants? Will technology replace Administrative Assistants? Let me provide a little bit of comfort. It will not! Sure, automation will inevitably become more and more widespread. However, there is and there always will be a need for human Administrative Assistants. And here is why. Change is inevitable. You either adapt to it and win, or you ignore it, and you lose. Gone are the days when answering phones, pouring coffee and scheduling meeting were the primary functions of Admin Assistants. Nowadays AA/VAs are dynamic admin superheroes! They have far more creative responsibilities than they used to. Marketing, website development, social media management, online customer service – you name it! Admin Assistants can handle them all. Specialize in one of those fields and you will advance in your career faster. The opportunities are greater than ever! Let’s face it, automation will replace some routine tasks like filing or typing. For example, many companies do not require hard copies of files anymore. Technology has replaced the physical filing with virtual filing. But it is extremely difficult for an automated system to always put the right file in the right spot. And that’s where your administrative skills come in handy. Besides, not everything can be automated. Some tasks will never be! When it comes to creativity and social interaction robots simply don’t have the same emotional intelligence as people do. Negotiating and providing creative solutions is still too advance for technology to perform. Get creative, get educated, get social and you will always be ahead of the curve! You know, what they say, behind every great executive is an Administrative Assistant. With advancements in technology, the demand for qualified Admin Assistant Professionals (especially VAs) is higher than ever! The numbers say it all better. There are over 4000 Virtual Assistant positions available through Upwork. More than 75,000 AA/VA job postings on Guru and over 27,000 on Freelancer! And believe it or not, the Virtual Assistant industry is projected to grow rapidly in the next few years! Over the years, the administrative assistant craft has changed from a coffee-pouring and typing job into a dynamic admin superhero position! The future of technology advancement may bring even more opportunities for tech-savvy admin professionals! 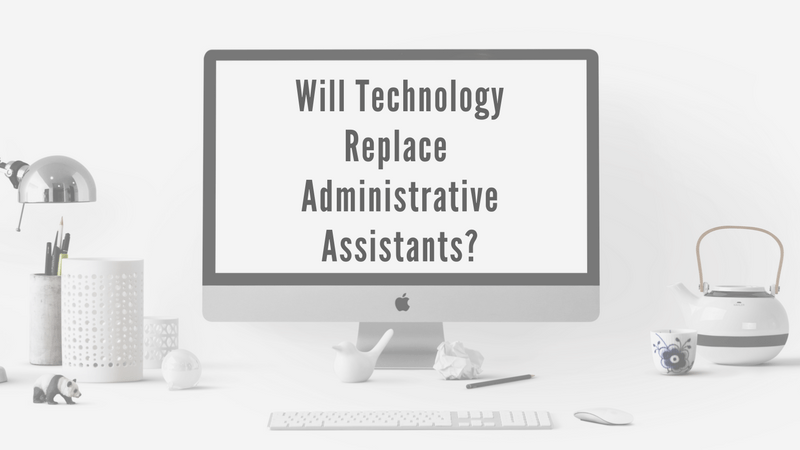 So will technology replace Administrative Assistants? Yes, in a matter it will adjust the craft. If you are ready to embrace the changes, Administrative Assistant / Virtual Assistant might be just a right fit for you! Take a look! Can I get financial assistance? What are my career prospects? Program - Select a program - Select a program and let’s make this happen. First Name Whoops! Looks like you missed your first name! Phone You’re almost finished! We just need your phone number. By submitting this form, you are giving your express written consent for Enrollment Resources to contact you regarding our programs and services using email, telephone or text - including our use of automated technology for calls and periodic texts to any wireless number you provide. Message and data rates may apply. This consent is not required to purchase goods/services and you may always call us directly at 555-555-5555. I understand & agree Please agree to the terms. © 2019 CanScribe Career College. All Rights Reserved. Website by Enrollment Resources.